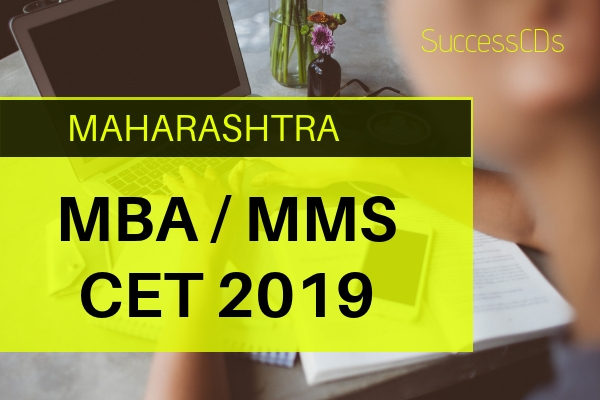 MAH CET 2019 for MBA MMS Admission - The Government of Maharashtra State CET cell shall conduct the MAH MBA/MMS CET 2019 for admission to first year of full time Postgraduate Degree in MBA /MMS Courses in various institute of Maharashtra, for academic year 2019-20. The Competent Authority shall conduct the MAH-MBA/MMS CET 2019 for admission to First Year of Full Time Postgraduate Degree Courses in Management (MBA/MMS) in various institutes in Maharashtra, for Academic Year 2019-20. The DTE Maharashtra has formally released the MAH CET 2019 Exam notification and announced the key dates and other important details such as MAHCET 2019 syllabus, MAH CET 2019 exam pattern. The MAH CET 2019 registration process has also started from 10th January 2019. For detailed analysis and understanding of all key facts and important information about MAH-CET 2019 is given below. Admissions to the following institutes will be based on the score of CET, provided they are approved & recognized by Govt. of Maharashtra and are affiliated to any of the Non-Agricultural University in Maharashtra State. Appeared for the final year examination of any bachelor's degree to be awarded by any of the Universities recognised by University Grants Commission or Association of Indian Universities in any discipline. Percentage of marks shall be calculated by rounding off to two places after decimal. Candidates belonging to SC, VJ/DT (NT (A)), NT (B), NT(C), NT (D), OBC and SBC categories should produce 'Caste Validity Certificate' issued by Scrutiny Committee of Social Welfare Dept. and the Candidate belonging to ST category should submit 'Tribe Validity Certificate' issued by Scrutiny Committee of Tribal Dept. MAH-MBA/MMS CET 2019 will be conducted in the selected cities in Maharashtra & Outside Maharashtra State. The cities in which MAH-MBA/MMS CET 2019 will be conducted are designated as "Centre" for the CET. Each centre may have many "Venues" depending upon the number of candidates appearing at that centre. MAH CET 2019 would be an online entrance test that would comprise of MCQs or multiple-choice questions; the exam would contain 200 questions divided into three sections i.e. Logical & Abstract Reasoning, Quantitative Aptitude, Verbal Ability and Reading Comprehension. The time for the test is 2 hours and 30 minutes; however, you may have to be at the venue for approximately 4 hours including the time required for logging in, collection of the Hall. Ticket, going through the instructions etc. Candidates to go to the http://www.mahacet.org/mba2019 website and click on the option "APPLY ONLINE" which will open a new screen. Application Form Processing Fees as stated below is to be paid through online system only by Internet Payment, Credit Card/ Debit Card (RuPay/Visa/MasterCard/Maestro), Internet Banking, IMPS, Cash Cards/Mobile Wallets for which the service charges, as per rules, shall be applicable in addition to the application form processing fees. For Open Category Candidates from Maharashtra State, Outside Maharashtra State (OMS), J & K Migrant candidates - Rs.1000/-. For Candidates of Backward Class Categories [SC, ST, VJ/DT- NT(A), NT(B), NT(C), NT(D), OBC, SBC] and Persons with Disability Candidates belonging to Maharashtra State only - Rs.800/-. MAH-CET 2019 admit card would be made available to the candidates online through the official exam portal i.e. http://www.mahacet.org/mba2019 from 01st March 2019 onwards. Candidates who have successfully registered themselves through the online registration process, will be able to download their MAH-CET 2019 admit cards online by logging into their account. The DTE Maharashtra will not send a hard copy of the admit card to the candidates through post or courier. Therefore, candidates are requested to download their MAH CET admit card and take a printout of the same. As per the official notification for MAH CET 2019, the DTE Maharashtra would announce the MAH CET 2019 results on 31st March 2019. Just like application / registration process and issue of admit card; the MAH CET 2019 MBA result would also be announced on official website.